(Bloomberg) -- A Macquarie Group fund manager is shrugging off warnings from equity analysts and buying into South Korean refiners, betting that oil’s recovery will steady faltering stock prices. Jeon Kyungdae, who oversees equities at Macquarie Investment Management Korea, boosted shares of SK Innovation Co. and S-Oil Corp. in his portfolio from the end of 2018 to early January. He’s predicting crude’s rebound this year will lift investor sentiment and easing U.S.-China trade tensions will aid global growth. The stocks -- which plunged more than 15 percent last quarter -- would benefit, he said in an interview. Typically, stronger crude would result in higher input costs for fuel makers and crimp refining margins, hurting profits. But Jeon’s bet is based on his view that the shares will shadow oil prices, rather than the performance of the companies’ processing operations. “In theory, it’s refining margins that should be the focal factor driving their stock prices, but from investors’ point of view who actually buy these shares, the overall crude prices weigh more on our decision,” said Seoul-based Jeon, whose Macquarie New Growth Securities Master Investment Trust fund beat most of its peers over the past five years. Crude’s quick drop into a bear market from a four-year high in October coincided with shrinking returns from making gasoline, which dragged Korean refinery stocks to their first annual loss since 2014. That’s led analysts to cut earnings estimates for the firms. This month, shares in the companies -- who last year gave rosy outlooks for fuel margins -- have stayed little changed while oil has rebounded more than 10 percent. Sell-side analysts, meanwhile, see a tough environment for the refiners. They have cut their estimates for fourth-quarter results at SK Innovation by an average of 53 percent over the past four weeks, with predictions ranging from a 898-billion-won profit ($800 million) to a 271-billion-won loss, data compiled by Bloomberg show. Forecasts for S-Oil have been cut by 59 percent on average. The outlook for the first three months of 2019 has also been reduced. Hwang Kyu-Won, an analyst at Yuanta Securities Korea, slashed his 2019 price target on SK Innovation shares to 260,000 won from 290,000 won, saying the current market consensus for fourth-quarter earnings is “too high.” He expects an operating profit of 89.4 billion won, compared with the 284 billion won that’s the average of 17 forecasts compiled by Bloomberg. Profits for S-Oil will be at about 21.1 billion won, which is just 6 percent of its third-quarter earnings, according to Kyobo Securities analyst Young-Joo Son, who cut his price target on the stock by 20 percent to 130,000 won. Yet despite the grim earnings predictions, the analysts’ price targets are above current share prices. About 80 percent of the 36 analysts tracking S-Oil still recommend buying the stock, as do 30 of the 35 analysts covering SK Innovation. That ostensible exuberance may reflect a tendency for bullish ratings to prevail even as profit forecasts are cut for companies in South Korea, where an analyst last year apologized for triggering a sell-off in K-pop talent agencies and walked back negative comments on the outlook for the industry. For Macquarie’s Jeon, Korean refiners are a “buy” because, apart from the boost the shares will receive from oil, the processors stand to benefit in the long-term from investments made in more sophisticated distilling units that’ll fetch them better margins versus regional peers. International Maritime Organization rules mandating the use of cleaner-burning fuels on ships starting next year will lift demand for diesel, which will also benefit the companies, he said. Jeon didn’t disclose the amount of shares he added to his portfolio or the overall size of his investments. SK Innovation’s stock trades at 8.3 times its profits for the next year, while S-Oil has a multiple of 8.4 times. That compares with 17 times for Taiwan’s Formosa Petrochemical Corp. and 13.5 times for India’s Reliance Industries Ltd., data compiled by Bloomberg show. 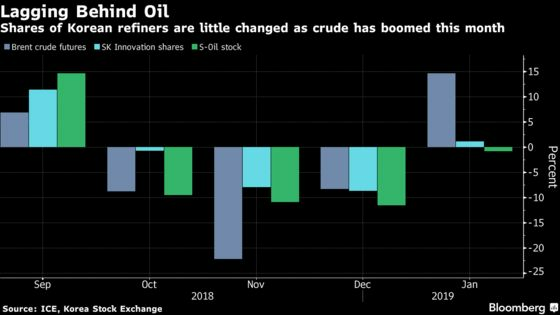 S-Oil’s dividend yield is projected to be 6.3 percent for the next 12 months, more generous than the average 2.6 percent of Kospi 200 index members, Bloomberg Dividends Forecasts show.